You may have read articles about the ways supplemental D-ribose can boost your endurance and ease workout recovery, but did you know that it can do more than just kick up your performance in the gym? D-ribose, sometimes referred to as just “ribose”, is a simple sugar your body produces and uses for energy. (x) The “D” prefix refers specifically to ribose found in nature. Another form of ribose, L-ribose, is synthetic and can only be made in a lab (x). So how does this sugar work in your body? If you’re a science buff, you know that ribose is part of the nucleotide ribonucleic acid (RNA). Without ribose sugar, our bodies would not be able to grow cells or repair damaged ones. Ribose plays an important role in the function of RNA, stabilizing it so it can deliver messages to DNA (deoxyribonucleic acid) for replication (x). DNA must replicate so our bodies can make new cells. But RNA breaks down quickly, making it an unsuitable sugar to compose DNA. DNA, as its name suggests, is composed of the sugar deoxyribose, which is different from ribose by removing one atom of oxygen (x). D-ribose is particularly important for mitochondrial function, a process by which cells generate energy. As the body naturally ages, mitochondrial function gradually declines, and cells lose integrity (x). Supplementing with D-ribose may help people with certain conditions, like cardiovascular disease, chronic fatigue syndrome, and fibromyalgia have abetter quality of life. 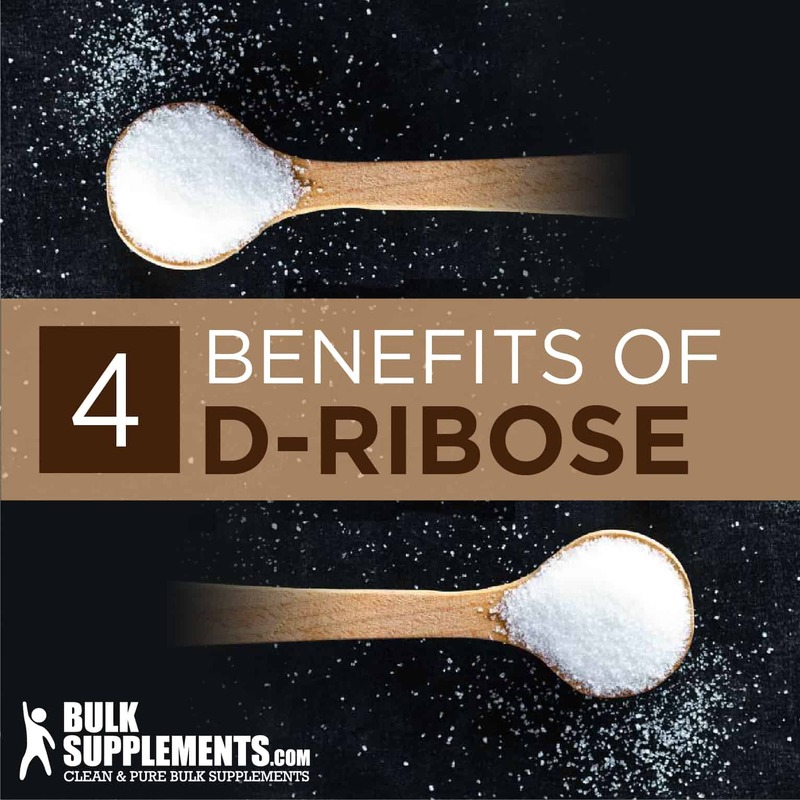 Some scientists believe that supplementing D-ribose may help restore energy to muscle cells even faster. Adenosine triphosphate (ATP) is a molecule made of adenine (one of the building blocks of DNA) and ribose. Its stores drop rapidly during and after exercise. ATP functions as an energy-delivering device for cells. For instance, when your muscle cells need energy to keep moving, storage molecules give chemical energy to ATP. ATP delivers energy to cells, and cells break down ATP in the process of receiving it (x)(x). Read on for more information about how D-ribose can improve your health and well-being. Research suggests that taking D-ribose by mouth may be a good supplement for energy and result in better workouts and easier recovery. The theory is that by supplementing with D-ribose, the cellular processes in the body that are responsible for energy production may be able to power muscles for a longer period of time (x)(x). One study looked at 26 participants who performed high intensity exercise to see if D-ribose would improve their performance. Some of the participants took D-ribose, and a placebo was given to a control group. The results showed that the group who took D-ribose showed an increase in their performance output, whereas the control group did not.This was a very short study (3 days), but the study showed promising information and it would be worth repeating over a longer stretch of time! (x). Cardiovascular disease is the most common cause of death in the world. Fortunately, you may be able to take preventative action. Lifestyle changes such as increasing your exercise and carefully monitoring your diet can lower your risk. Some common causes of heart disease are obesity, high cholesterol, high blood pressure, alcohol abuse, and tobacco use (x). If you are suffering from the symptoms of cardiovascular disease, D-ribose may be able to provide you with some relief. It might help you breathe better by healing some of the tissues in the cardiovascular system, making it easier for oxygen to flow through the heart and lungs. In one study, patients had a decrease in shortness of breath,which is a major symptom of heart failure (x) (x). D-ribose may even impress your doctor by lowering your LDL cholesterol (the “bad” cholesterol). LDL cholesterol, which is made up of lipoproteins, can build up in the arteries and reduce the flow of blood to the heart. Scientists in a 2014 study looked at mice who had been injected with human LDL cholesterol. They treated the mice with D-ribose combined with L-cysteine, which significantly lowered LDL levels (x). For people with ischemic cardiovascular disease, D-ribose may increase ATP (the molecule that assists muscle cells in storing and using energy), and aid in tissue recovery (x). 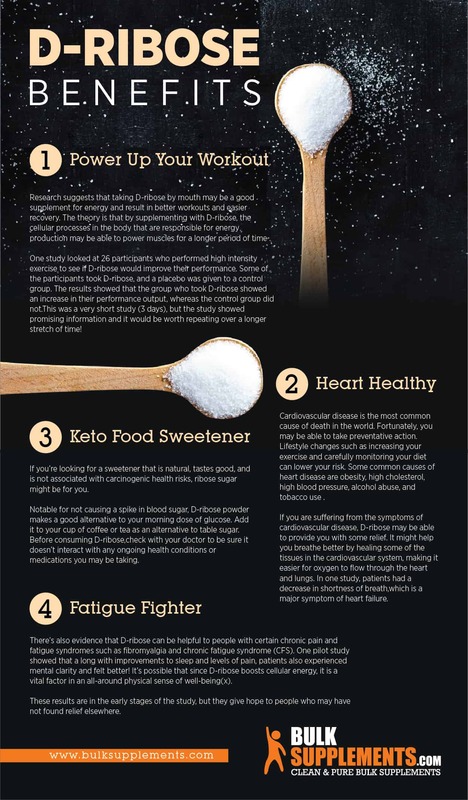 If you’re looking for a sweetener that is natural, tastes good, and is not associated with carcinogenic health risks, ribose sugar might be for you. Notable for not causing a spike in blood sugar, D-ribose powder makes a good alternative to your morning dose of glucose (x). Add it to your cup of coffee or tea as an alternative to table sugar. Before consuming D-ribose,check with your doctor to be sure it doesn’t interact with any ongoing health conditions or medications you may be taking. There’s also evidence that D-ribose can be helpful to people with certain chronic pain and fatigue syndromes such as fibromyalgia and chronic fatigue syndrome (CFS). One pilot study showed that along with improvements to sleep and levels of pain, patients also experienced mental clarity and felt better! It’s possible that since D-ribose boosts cellular energy, it is a vital factor in an all-around physical sense of well-being(x). These results are in the early stages of the study, but they give hope to people who may not have found relief elsewhere. D-ribose is produced in the body naturally, so there are relatively few side effects associated with it. However, going above the recommended dosage can cause adverse side effects such as diarrhea or hypoglycemia. If taken for too long over an extended period of time, it can result in headaches, low blood sugar and gastrointestinal discomfort. For diabetics, D-ribose can cause blood sugar levels to plummet, so a medical professional should be consulted before beginning a course of this supplement. Surgery patients or women who are pregnant or nursing should avoid this supplement. It should be taken with food or directly after a large meal. D-ribose supplements are recommended to be taken in servings of 5 grams (just over 1/2 tbsp) three times per day, with meals. After about one month of taking D-ribose, it is possible to reduce servings down to 5 g daily and still experience the same effects. This supplement can be dissolved easily in water, juice or sports drinks. It tastes sweet and is derived from fermented corn syrup. 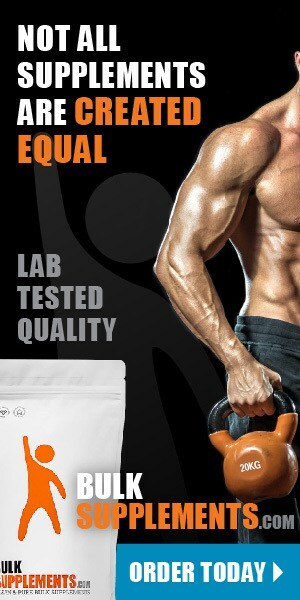 D-ribose can be mixed with Creatine to enhance results. D-ribose can be used to enhance your performance, relieve pain and fatigue. The benefits that D-ribose could have on the health of your heart are extraordinary! Not only does it heal damaged tissues in the heart, but it also lowers your cholesterol. This is an easy-to-take supplement—you can take your daily dose in a cup of coffee or blended into your smoothies. We think there is a lot to love about D-ribose, so give it a try!